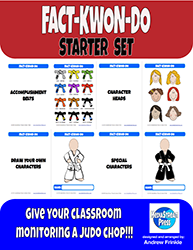 This page is dedicated to the super-fun Fact-Kwon-Do monitoring and behavior system. It now has 2 expansions, adding more characters and the ability to track and teach math facts! Get this awesome tool to monitor student progress in things like: behavior, spelling, math facts, vocabulary, testing, and more! Boy and Girl heads to paste on if you don't want to draw your own! ​Get your copies on Amazon! Add the expansion set to make some really cool additions to the set. 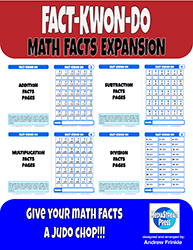 Add the math expansion set to make learning you facts way more fun!